The Salah v Ramos debate certainly hasn't quietened down over the bank holiday weekend, to say the least. 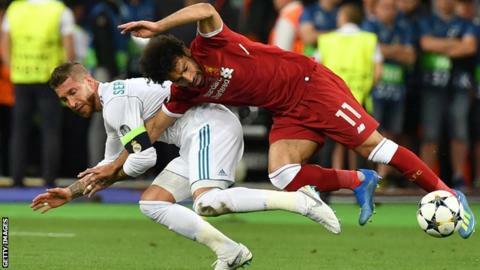 The latest update in the post-Champions League final debate now involves an Egyptian lawyer who has allegedly launched a huge €1 billion (£872m) lawsuit against Madrid defender Sergio Ramos for inflicting "physical and psychological harm" to the Liverpool forward. Now, you might think this is a tad extreme - but Bassem Wahba's legal action only scratches the surface. Thousands of incensed Reds fans have signed a petition, which, at the time of writing, has reached 462,318 signatures. Cast your mind back to November 2009 for France's World Cup play-off second leg against the Republic of Ireland. Thierry Henry's infamous assist in particular. Henry handled the ball before passing it to William Gallas to score the decisive goal that sent France to the World Cup in South Africa, winning the tie 2-1 on aggregate. Following the controversial incident, Henry admitted: "I will be honest, it was a handball. But I'm not the ref. I played it, the ref allowed it. That's a question you should ask him." But an admission simply was not enough for the Ireland fans, who were further outraged after the astonishing revelation that the Football Association of Ireland (FAI), accepted $5m (£3.7m) from Fifa not to pursue a legal case. There were calls for the tie to be replayed but, when Fifa ruled that it would not be feasible, the fans had to - albeit reluctantly - admit defeat. Luis Suarez has been known for his fair share of controversial incidents - but who could forget the 2010 World Cup quarter-final between Uruguay and Ghana, when Suarez handled on the line to deny the Ghanaians a winner in the dying seconds of extra-time? Suarez was sent off while Ghana were given a penalty, but Asamoah Gyan hit the crossbar with his spot-kick to send the match into a penalty shoot-out, which Uruguay won 4-2. Ghana seemed certain to become the first African side to reach the last four of the competition, but instead, Uruguay advanced to the semi-finals of the World Cup for the first time since 1970. In another controversial World Cup incident in April 2013, Suarez bit Giorgio Chiellini in a 2014 World Cup match against Italy - resulting in a four-month ban and a £65,680 fine. 22 June 1986. The day of the infamous quarter-final in Mexico which saw England defeated - literally - at the hands of Argentina captain Diego Maradona. Officials failed to spot Maradona using his hand to score when jumping for the ball with goalkeeper Peter Shilton, knocking England out of the competition. Maradona even dubbed it a 'Hand of God' goal - a phrase that has become synonymous with this key moment in the history of the beautiful game. In 2005, Maradona told his own TV show in Argentina: "The truth is that I don't for a second regret scoring that goal with my hand." Earlier this year, Shilton took to Twitter to ask his followers what he should do, after he was invited to meet Maradona in June for what would be the pair's first meeting since the incident.